Alright, time for Part 2! These are our top two places to visit in Portland are coming up! #2 – Voodoo Doughnuts – This is a Portland staple! With lines stretching out the door, and open 24/7, the incredible variety of donuts in the bright pink box will satisfy anyone’s cravings. We got six of the most amazing doughnuts. My personal favorite was the Maple-Bacon one featured on the front page of their website. 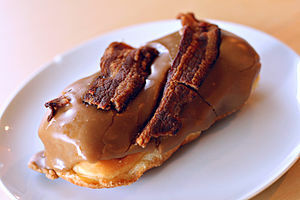 Bacon + Maple doughnut = delicious. Be prepared for a wait, or go early in the morning. I would suspect that late at night is actually a tougher time to get them, as the after-clubbing crowd is hungry for a post-party snack. #1 – Bamboo Sushi – Our number one spot belongs to the first sustainable-harvest full service sushi restaurant in America. This restaurant not only believes in being ecologically responsible, but also in serving high quality, locally sourced food. THeir sushi is amazing. We ordered three rolls between the two of us. And then ordered another one, the special – a Friday the 13th roll – because it was that amazing. I seriously was exceptionally impressed by the food, decor, people, everything. If you’ve got the time while in Portland or the nearby areas, definitely check these guys out. Where else would you recommend we go in Portland when we return someday?